These are very cute cookies and they taste good as well. The gingerbread cookies are full of wonderful spices guaranteed to spark the taste buds of your little gremlins and the frosting is "lick-a-ble" good too! 1. In 3-quart saucepan, heat sugar, molasses, ginger, cinnamon, cloves, nutmeg, and pepper to boiling over medium heat, stirring occasionally. Remove saucepan from heat; stir in baking soda (mixture will foam up in pan). Stir in butter until melted. With fork, stir in egg, then flour. 2. On lightly floured surface, knead dough until thoroughly mixed. Divide dough in half. Wrap half of dough with plastic wrap and set aside. 3. Preheat oven to 325 degrees F/160 degrees C. With floured rolling pin, roll remaining half of dough slightly thinner than 1/4 inch. With floured 3 to 4-inch ghost shaped cookie cutter cut dough into as many cookies as possible; reserve trimmings. Place cookies, 1/2 inch apart, on ungreased large cookie sheet. Reroll trimmings and cut out more cookies. 4. Bake cookies 12 minutes or until edges begin to brown. Remove cookies to wire rack to cool. Repeat with remaining dough. 5. When cookies are cool, prepare frosting (see below) to use to decorate cookies. While frosting is still wet, attach chocolate chips or pieces of licorice for the eyes and noses. Set cookies aside to allow frosting to dry completely, about 1 hour. Store cookies in tightly covered container (with waxed paper between layers, if decorated) at room temperature up to 2 weeks, or in freezer up to 3 months. 1. In bowl, with electric mixer at medium speed, beat confectioners' sugar, meringue powder, and 1/3 cup warm water until blended and mixture is so stiff that knife drawn through it leaves a clean-cut path, about 5 minutes. 2. If you like, tint frosting with food colorings as desired. Keep frosting covered with plastic wrap to prevent drying out. 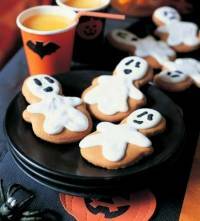 With small metal spatula, artists' paintbrushes, or decorating bags with small writing tips, decorate cookies with frosting. (You may need to thin frosting with a little warm water to obtain the right spreading or piping consistency). Meringue powder is available in specialty stores where cake-decorating supplies are sold. Or call Wilton Industries, 800-794-5866.